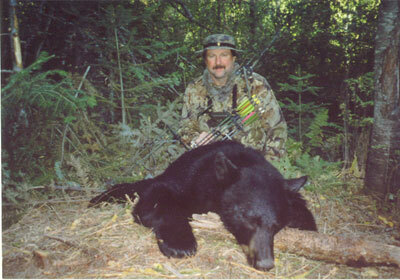 The author and his fall 2003 5-foot 8-inch "backyard" black bear. Taken from a Gorilla Silverback treestand, with his 70-pound Matthews Rival Pro, Beman ICS Carbon arrows and 4-blade, 100-grain Muzzy Broadheads. Living up here in the Idaho Panhandle can sure have its benefits for someone who enjoys pursuing big game as I do. The further blessing of residing smack in the foothills of the Bitterroot Mountains backed up to State and National Forest can only be considered the frosting on the cake. Its what we like to call our "free backyard." White-tailed deer, elk, and the occasional moose commonly find themselves feeding side by side in my pasture with my horses and mules. In fact, I believe the elk consume as much or more of my grass than my livestock. And as anyone who has spent much time hunting in North Idaho has discovered, black bears are abundant. And so it is for us right here at home. Within walking distance from where I write this, my son and I have erected a number of both permanent and portable treestands. Very handy indeed if a guy oversleeps a bit on a "hunting day," doesnt feel like traveling very far for a jaunt, or finds the time to sneak in a quick weekday morning hunt during our long days of early autumn. For us here in Idaho, the summer of 2003 had been an extremely long, hot drought. Fires raged out of control in the central mountains, closing many National Forests to all recreation. Here in the northern counties we were spared the flames but week after week without our usual rains took its toll on the habitat. As our September archery deer and elk season rolled around, the terribly dry conditions rolled right on in with it. I told myself in the predawn pink light of that late September morn that it was in my best interest to at least try to make a noiseless approach to my chosen stand, but in reality the only animal in the woods I was fooling was myself. The forest floor was littered with the dry, brittle leaves of the rocky mountain maples, chokecherry, and other broad-leaved trees that due to lack of water just could not hang on any longer. The normally silent diminutive chipmunk traveling through this stuff became a bull elk plodding along. I could just imagine what my size thirteen air-bobs sounded like to the forest denizens. I physically winced with each step. Twenty-one feet above the ground was quite a different story however. As I sat there awaiting the rising of the still too-hot sun, I was as noiseless as the very tree I was now attached to. Now it was my turn. Those terrifically noisy acres and acres of breakfast "cornflakes" that I had just suffered through had now become a best buddy. I strapped in, pulled up my Matthews, nocked an arrow, double-checked the wind drift with my squeeze bottle of talcum powder and settled in for the "dance." And a dance it was. No living thing could waltz by anywhere near my position that I was not made aware of it by the very conditions that made it so difficult for us "predators" to maneuver in on our prey. A white-tailed doe still wearing her summer "redcoat" and her twin spotty fawns let me know of their approach several minutes before they passed by at 50 yards. A ruffed grouse sounded as large as two tom turkeys as he plied the forest floor for a snippet of green clover. A snowshoe hare burst out of his copse in the thicket behind me with such a ruckus that I instinctively jerked my camo-netted head around the tree, expecting to see a six-point bull bearing down on me. That put my heart in my throat for a moment or two. Craning my neck around the large white pine, I watched intently for what had spooked him. "Coyote" was what I was thinking but nothing ever followed Mister Rabbit down the trail. Eventually with my body telling me to give up this position, I figured it was only a "nuthin." I turned my attention down draw in the direction of the well-used elk wallow in the brush- and timber-filled draw just 300 hundred yards below my house. With this extremely dry weather during this years rut, it had become a very important destination in the day-to-day wanderings of our local elk herd. My present perch positioned me overlooking the trails that led into the alder-choked bottom where the remaining slight seep of water in the otherwise bone dry draw came to the surface. Local bulls had enlarged this depression to the point that they could lay down in it and be completely covered with what they considered sweet-smelling mud. Previous mornings from this stand I had had several cows and calves pass within easy bow range and while legal, I was holding out for the herd bull that I had seen in the headlights of my pickup between my place and the paved county road. The sign he left behind let me know that the big boy was "using " this particular close-in wallow. Eternally optimistic bowhunter that I am, I liked to think it was just a matter of time. His cows had been here early in the season, he just had to hook up with them sooner or later, and sooner or later they would lead him past my waiting broadhead. I just hoped I would be there when they did. Since nature had provided me with the perfect early warning system, the tinder-dry understory, I knew that I would be more than ready when they decided to pay me a visit. Or so I thought. I kept myself awake with the thought of those six-point antlers and along with the "herd" of black-capped chickadees that kept trying to land on my arrow, I thought I was remaining somewhat alert. Even so, the small coal-black object that appeared silently out of the brush 40 yards away was a bit of a surprise. In spite of the elevated noise level of the woods, I had not heard a thing. What had caught my eye was a leg. It didnt take long for what it was attached to, to materialize. How in the heck did he get in on me without making a sound? At this point it mattered not. I had to get to my feet and get on him. He lifted his nose in the air and with a cautious sniff or two, he stepped out into full view. He wasnt the biggest bear in the Idaho woods but he was better than average  obviously larger than the little year-old dude that I had let walk on by this very same stand a couple weeks ago. Well over five feet, rolling in fall fat and glossy black, I decided that if he gave me the shot, I would take it. Besides, since I was in sight of my house, it was just a matter of time before he got himself into trouble around my place. Ever so carefully he shuffled his way up the elk trail in the bottom of the draw. He paused here and there to check the ground for both familiar and foreign odors. He gave me the feeling that he was very familiar with "my" home draw. He obviously felt as comfortable here as I did. I had come in to the stand from a different direction than his path, so I knew I was safe from detection, at least for now. If he held his bearing, he would have to pass by me before he crossed the unforgiving scent of my back-trail. This is a good thing! He continued to come on, his left shoulder quartered toward me, precluding a shot for now. When his head passed behind the first tree, I silently (I hoped) got to my feet. Still he came. Slowly, but unafraid, he closed the distance to 20 yards. Here was my opportunity. With his eyes behind the last tree between him and me, I came to full draw. Of course he hesitated! Dont they always do this while you hold back what seems like the entire 70-plus pounds? Did he hear something? Did his ultrasensitive nose pick up stray ravel of wind bearing my scent? Did I blow it? Wouldnt be the first time. No. A couple more shuffling steps and he was broadside at 12 yards. I released. When the metal met the meat, all hell broke loose. A mature boar bear does not take physical injury lightly. Their usual response is immediate and violent. With a roar he leapt sideways away from the intrusive shaft, slamming into a huge white pine. Growling and biting at the wound, he spun to escape his unseen attacker. His attempted flight would do him no good, however, as the steel-tipped carbon missile I had unleashed into his world had completely penetrated his heart and was buried in the earth behind where he had been standing. He made it a total of 32 paces and piled up in plain view. You gotta love that Muzzy moment. How that 210 pounds of fat, fang and claw traveled ever so silently through that crispy fried canyon that day last September I shall never know. I pondered this question while I got him ready to transport up the hill to my pasture and pickup. Maybe I had dozed off a bit, maybe not. At this point, it really didnt matter. This bears days of roaming my back yard were through. And remember: TAKE A KID HUNTING!